I liked the Introduction, Brief Summary of Sacred Scripture and the Chronologies of the Old and New Testaments. 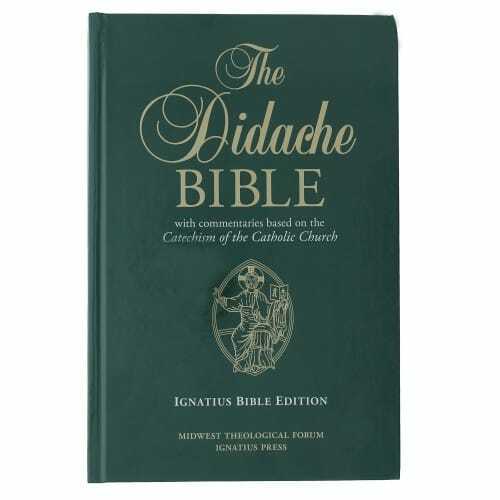 I also liked Cardinal Francis George's explanation of how this Didache Bible "includes extensive commentaries of Sacred Scripture based on the Magisterial teaching as presented in the Catechism of the Catholic Church." This helps me to "better understand the teaching of the Church on current issues." This is the best bible I've ever owned. With detailed book descriptions, glossary, study guide, preface and scholarly footnotes, it's like having a biblical scholar with you as you are reading. I highly recommend the Didache Bible for the serious lay or collegiate student. I have found this Bible to be a wonderful help in my spiritual journey. The cross references to the Caticism of the Catholic Church are an excellent help in understanding the Catholic faith. I would recommend this Bible to all my friends. I love my new Bible, it's just want I wanted. It's very informative. The explanation of the scripture is written in a way I can understand it more. Perfect addition to our selection, We do not have this version and cannot wait to get into it. Anyone who wants help in interpreting scripture can do no better than with the Didache bible. All explanations proceed from the Catechism of the Catholic Church. What better source is there? I love this Bible and have recommended it to several other people who have gone on to purchase it. This is an amazing publication. The explanations that follow the Gospel sections are clear, concise, and tremendously helpful. I am loving it! The commentaries are extremely helpful in preparation of CCD classes. It is easy to read (black on white). My old bible had brownish paper. I am glad that it provides a cross reference with the Catechism. It is a great study Bible. This is the Bible I will use for my future classes. I want the students to know why we believe what we believe & the Apologetics index is a great help. Great for Bible study & for Homeschooling/Catechism. I got my Didache Bible about a week ago. I have been using it ever since. I like it a lot especially for the comments. It is very good to use as a study bible. I would recommend it to one who is serious about learning more about their faith!